Harry Jones, Project Manager for the ISIS Second Target Project has been awarded an MBE in Her Majesty the Queen's New Year Honours List. Harry, who is Head of the ISIS Target Division at the Rutherford Appleton Laboratory's ISIS Neutron Source, joined the Laboratory as an apprentice over 40 years ago. He has reached the top of his profession through a varied and distinguished career including early contributions to particle physics experiments at CERN. "No-one could deserve this award more than Harry Jones," said ISIS Director Andrew Taylor. "His contribution to delivering this world-leading project was absolutely key. Just as importantly, throughout his career Harry has developed and mentored successive generations of young engineers, contributing to the engineering skills base not only in this laboratory but more widely across the different sectors of UK industry where many of them now work." Harry was involved from the very beginning in the design and construction of ISIS, working on the mechanical design of the accelerator which came on stream in 1984. 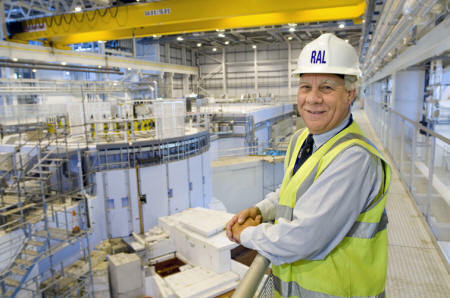 When the facility's Second Target Station was given the go-ahead in 2002, Harry was the obvious choice to be the Project Manager for this £145 million investment in UK science. The Second Target Station was completed in 2009, on time and within budget, and has fully met its challenging specification. It is already contributing to our understanding of advanced materials, soft condensed matter and bio-molecular systems.